Dental therapy was first introduced to the United States in 2006. Dental Therapists educate patients about oral health, perform evaluations, give fluoride treatments, place sealants, clean teeth, place fillings, and perform simple extractions. A 2017 University of Washington study found that greater access to dental therapy resulted in fewer extractions among both adults and children. Dental Therapy is nationally recognized. The Commission on Dental Accreditation (CODA) has established national standards for dental therapy education programs. 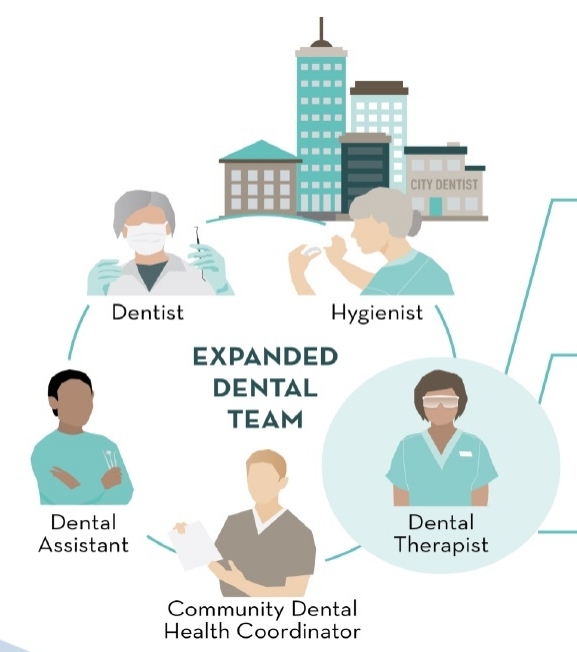 Dental therapists will expand dental care access where it is most out of reach, providing quality and timely care to rural communities, low-income communities and communities of color, and to patients who are publicly insured or uninsured. A 2017 University of Washington Center for Workforce study examined access to oral health care. Dentists, family physicians, pediatricians, and other stakeholders named dental therapy as a solution. DENTAL THERAPISTS STRENGTHEN THE DENTAL TEAM. Dental therapy gives dentists and oral health clinics an opportunity to expand their business. Adding just one dental therapist means a dental practice can take 2,000 to 3,000 more appointments a year. For every dollar they generate, a dental therapist costs less than 30 cents to employ. A 2013 American Dental Association study recognized that dental therapists provide high-quality service. Dental therapy WILL complement other state efforts to increase access to care. Capital investments expanding community dental clinics can’t be maximized without an adequate workforce. Expanding Washington’s dental team will leverage clinic expansion to reach the most patients in need. Dental therapists could save hospitals money by providing high-quality, routine care. In a single 18-month period, dental problems prompted 54,000 visits to Washington’s emergency rooms, costing $35 million. Dental therapists will prevent costly emergency room visits. A 2010 Washington State Hospital Association report found that dental emergencies are likely to be the result of not having regular dental care. DENTAL THERAPISTS ARE ALREADY PRACTICING IN WASHINGTON. Dental therapists are already practicing in Washington state, thanks to state lawmakers and Tribal leaders. State lawmakers passed Senate Bill 5079 in 2017 to create a path toward better access to health care in Tribal settings throughout the state. States that have authorized or have dental therapists working within state boundaries include Alaska, Arizona, Idaho, Minnesota, Michigan, Oregon, Vermont and Maine. 12 other states are actively exploring authorizing dental therapy. It's time for statewide Dental Therapy in Washington!